“Experience the magic and warmth of the inspiring true story of living legend Dolly Parton’s rags-to-rhinestones upbringing in Tennessee’s Great Smoky Mountains. Meet the close-knit, hardworking Parton family as they struggle to overcome devastating loss and discover the healing powers of forgiveness, faith…and one very special coat. This colorful patchwork coat – so vividly described in the well-known song of the film’s title – helped empower the Southern songbird whose voice has touched hearts around the globe. Poignant and uplifting, this family-friendly film stars singer-songwriter Jennifer Nettles (Sugarland) and Ricky Schroder (NYPD Blue, 24) as Dolly’s parents, Gerald McRaney (Longmire, Deadwood) as her Grandpa Jake, and young Alyvia Alyn Lind as the courageous, outspoken 9-year-old Dolly.” That’s the official description for Dolly Parton’s Coat of Many Colors, now available on DVD from Warner Bros. Most of the time I avoid family-oriented films, mainly because they are not very good. The acting is amateurish, the dialog is awkward, and the story is poorly written. Luckily, this is not the case with Coat of Many Colors, which was originally a made-for-TV movie and aired in December 2015. Unlike other films in the same category, Coat of Many Colors provides a very believable story that focuses on not only the good times but also the tragedies that can befall a family. The story is based on true events during the childhood of Dolly Parton, which are also outlined in her song of the same name, Coat of Many Colors. It begins by introducing us to the happy Parton family as they go off to church with 9-year-old Dolly (who already knows how to play the guitar and sing). But right at the beginning we know not all is well since Dolly’s father decides to skip the service by waiting outside while the preacher (his father-in-law) gives a sermon. This is one of the main themes during the film and intertwines with the other dark times that the family must work through in order to keep from breaking apart. 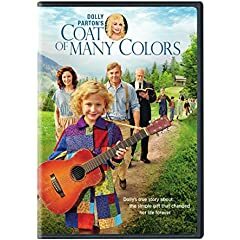 The title of the film (Coat of Many Colors) comes from one of those dark times when Dolly’s mother (needing something to pull her back from the brink of despair) decides to sew a new coat for her daughter. Not only does the coat help her mother, but it also helps Dolly learn about loss, love, and forgiveness. * Coat of Many Colors: Bringing the Song to the Screen - approximately 7 minutes long, this is a look behind-the-scenes at the making of the movie. Dolly Parton talks about how everything came together to create a movie from a song. The featurette also includes interviews with other members of the cast including Alyvia Alyn Lind (Dolly), Jennifer Nettles (Avie Lee Parton) and Ricky Schroder (Robert Lee Parton). * Deleted Scenes - 10 minutes of additional footage that didn’t make it into the movie. * Dolly Parton’s Coat of Many Colors: Come Visit Georgia PSA - here the producers talk about how they found the perfect location for the film. * Alternate Version - This is an alternate version of the entire film with some changes, which are mostly subtle, but it’s still worth watching. I was pleasantly surprised by Coat of Many Colors because unlike many other family-oriented films, it actually had a good storyline, a wonderful cast who did an excellent job, and a good script with dialog that sounded authentic. If you enjoy this type of film, a good story, or you’re just a Dolly Parton fan, I think you’ll also enjoy Coat of Many Colors. For more information, visit www.warnerbros.com.